Calling it “unprecidented,” Intermec today announced it’s new IP30 add-on RFID reader: a cost-effective, compact, globally-certified solution for adding mobile RFID read/write capability to the latest generation of Intermec mobile computers including the CN3, CN3e, CK61, and upcoming CK61ex. According to a press release, Intermec’s IP30 provides “the most versatile handheld RFID system available today” through its snap-on design, a combination of advanced data-collection methods, and GPS location association and communication via multiple radios. The IP30 also delivers mobile RFID read-write capability both within buildings and outside them. EVERETT, Wash.–(BUSINESS WIRE)–Intermec (NYSE:IN) announces the IP30 add-on RFID reader, a cost-effective, compact, globally-certified solution for adding mobile RFID read/write capability to the latest generation of Intermec mobile computers including the CN3, CN3e, CK61, and upcoming CK61ex. The Intermec IP30 provides the most versatile handheld RFID system available today. The snap-on design gives users unmatched flexibility. Through a combination of advanced data collection methods, GPS location association and communication via multiple radios, the IP30 delivers mobile RFID read-write capability both within buildings and outside them. IP30 can be purchased with, or added to, an existing installed base of CN3 Series or CK61 mobile computers, allowing customers to add RFID capability, or increase the scale of existing RFID installations, when they are ready. The IP30 posts two RFID industry firsts. It becomes the first handheld RFID system with integrated GPS and WWAN when combined with the Intermec CN3 mobile computer. 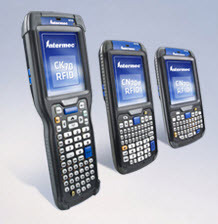 In addition, when the IP30 is combined with the Intermec CK61ex, it becomes the first handheld RFID system with an integrated near/far bar code imager enabling users to scan both 1D and 2D barcodes from a variety of distances up to 50 feet, conveniently complementing RFID data collection. Both firsts assure investment protection for customers as they build the supply chain of tomorrow. The Intermec IP30 handheld RFID reader is now available for order worldwide.